There is a new visitor rapping on my garden gate. I did not invite him, nor his many friends and relations. I have never seen him before, nor do I wish to ever see him again. In the hot summer season of dry crunchy grass, wilting pepper plants and the occasional dried up water barrel; his presence in my garden adds insult to injury. He is ugly. So is his girlfriend. 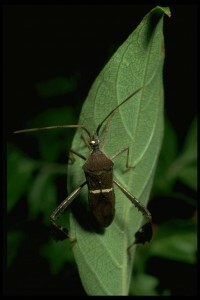 He is Leptoglossus phyllopus, aka the leaf-footed bug. Just when you think you have seen every single pest known to man, another one comes knocking on your door looking for nourishment. Over the years I have had carrot rust fly on the carrots, cucumber beetle on the cucumbers, squash borer on the squash and cabbage looper on the…yep…you guessed it…cabbage. These are just a few of the many names on the Willburn Most Wanted List. Some years are better than others – causing me to either weep with sorrow or go down on my knees in thanksgiving. But one thing remains certain time after time: stressed plants attract opportunistic pests and disease. 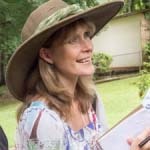 A stressed plant on the other hand – a wilting plant, a plant without hope of water or nourishment, or love for that matter….gives off weakness pheromone like a newborn wildebeest on the Serengeti. Who knows why this is so, but then, who knows why ninety honey bees found a ½ inch splat of beeswax on my deck this morning – insects have senses beyond our puny imaginations. All it takes is a plant on the endangered list and the little gold diggers move in, ready to divest it from life, liberty and the pursuit of happiness. Take last year’s beans for instance. They didn’t have a chance. The seedlings that escaped beheading from a mercenary earwig army dealt with early hot temperatures and lack of water and grew about as fast as a sullen conifer seedling. Just as I was starting to feel sorry for them and give them a little more of the wet stuff, spider mites moved in and stippled the leaves to such an extent that photosynthesis was no longer a viable option. By the end of the season they had headed over to the compost pile to save me the trouble of digging them up. How very considerate. 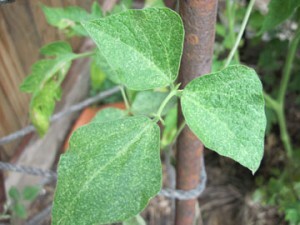 Now, I didn’t have spider mites on my beans two years ago, or, if I did, they were so few and insignificant that I overlooked their presence. But then again, my beans were healthy that year and exuded joie de vivre by the metric ton. So here I am, in the midst of this year’s season, coming face to face with a new kid on the block – a juicy-fruit terminator brought out of the woodwork by the mournful sounds of stressed vegetables singing Kumbaya in the evenings. I don’t know how I’ll get rid of him – he’s not clumsy enough to be caught in my soapy water bucket. He’s quicker than a stink bug and doesn’t want a nap and a cigarette after mating. And since I have no desire to spray ripening tomatoes with pesticide of any kind, I suppose I’m going to have to leave it up to the birds. Good luck with getting rid of them! I just had them identified for me. I didn’t realize they were a threat. They’ve been hanging out on my sister’s sunflowers for a month and didn’t seem too bad. But I think I’ll try spraying them with soapy water before they move over to my side of the garden! Hi I am having a hard time with these bugs I am stressed out. When I spray soapy water they go around the fruit and I get so angry. I just found out they like pomegranates and the fruit always falls and I wondered why they would fall and one day I saw that beast and I looked it up the internet and I found out it was the leaf footed bug and I don’t know what to do !!! Help!! I am so sorry you are frustrated with this insect. It is a great deal more difficult to deal with that a common or invasive stink bug as it moves much more quickly, and is wise to the soapy water treatment. Horticultural oil sprayed directly on the bugs may suffocate them, but is usually more effective against smaller, less armored creatures such as aphids or spider mite. Permethrin sprayed directly on the bugs will kill them (it is a neurotoxin), but it is also highly toxic to bees and other beneficial insects, and cannot be sprayed on small tomatoes (which is my first ‘red flag’ alert that it really isn’t any good for human beings). I am dealing with squash bugs right now and my method is to either a) destroy the infested plant if the infestation is too large and the plant is now dying (and clean up ALL debris), or b) disturb the plant with shaking, soapy water etc, until all bugs have jumped off (or in the case of LF bugs – flown off), check the ENTIRE plant for egg masses and remove, and then, cover the plant with lightweight floating row cover or netting. This will save your current batch of toms, but make it difficult for pollinators to get to flowers for your next batch. Unless the pomegranates show a great deal of damage, I would not be convinced that it is this bug that is making them fall – or that it is indeed doing anything to the fruit besides being attracted to the reddish color (poms are extremely hard skinned). Most fruit crops usually drop some fruit in June in a natural thinning process. Try to keep your chin up, some years have higher infestation rates than others! Good luck – and make sure that you completely dispose of ALL debris from tomatoes and surrounds in garbage bags in the trash can. Do NOT compost it.